A considerable amount of time and research should be done before you ever invest in Houghton Lake wood floors. The key thing to remember is that hardwood completely transforms your room in a way that distinguishes it from other types of flooring. Most homeowners have a general understanding of the kind of look they're trying to achieve with hardwood floors. There are many details left out, however, and you may not get the desired results you're looking for. The best strategy is to hire a professional, certified flooring consultant who can give you important information and things to think about as before you take the first step. It's good to take an inventory of your home before begin laying down the wood. For instance, what type of climate do you live in? Do you live on the coast? How much does it rain? Is there high humidity? The type of climate and amount of moisture in the air should affect the type of wood you purchase. Another consideration should be the type of sub floor in your home. Most properties in the Houghton Lake area have sub floors made of concrete or tough plywood that's at the ground level. If your sub floor is damaged or uneven, adjustments will need to be made before you install the flooring. Not all Houghton Lake hardwood flooring is created equally. So it's a good idea to do a little research or ask a Kabinetree Koncepts expert about the types of hardwood flooring available and which is the best for you. Generally speaking there 4 different types of hardwood construction. 3/4 inch hardwood flooring is common and very popular. This type of flooring expands with moisture and should be installed over wood base. 5/16 wood is thinner and can be glued to concrete. Engineered hardwood is made using cross-layer construction and is flexible enough to be installed anywhere in the home. Finally, locking hardwood is a floating floor system that requires no adhesive or attachment to the floor. One of the great benefits of hardwood that make it a popular choice with homeowners is that it comes in a wide variety of stains, colors, and styles. Each of these are largely governed by what type of wood is used in making the flooring. You can choose from American made wood such as oak, maple, and cherry. There are also exotic species of woods such as bamboo, Brazilian cherry, and even cork. Each species distinguishes itself by the level of mass and also grain patterns. No two pieces of wood are ever the same. You can also select from different widths and shades of stain. While some products are pre-stained, you can also have your flooring custom created to suit your personal taste. The difference between a less than satisfactory installation and a superior installation with amazing results is in the expertise of the company that is installing the hardwood. Hardwood installation in Houghton Lake is a major remodeling investment that drastically alters your room for better or worse. So the last thing you want to do is sacrifice quality in order to save a few bucks. 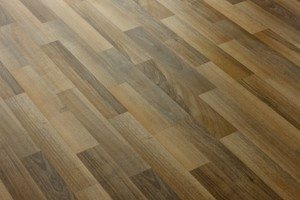 The type of installation being done will be determined by both the type of product you have and the type of sub-flooring you'll be implementing your hardwood on. Common techniques include groove-and-lock, gluing, nailing, and even stapling. The most effective technique is the one that provides maximum adhesion without any damage to the wood. If you are looking for the highest quality flooring in Houghton Lake, call Kabinetree Koncepts at 989-422-3545, or complete our online request form.